General Conference is right around the corner, 1-5 July 2019! At this crossroads in our history, it is time for us to come together to make decisions about our future and celebrate God who continues to carry us. Founder, Rev. Elder Troy D. Perry. 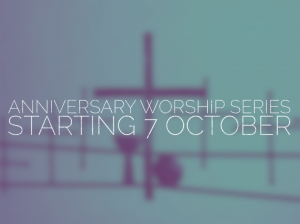 As you plan your celebration, you will also find resources for a 5-week Anniversary Worship Series below. May these resources breathe life into you as you read them and share them with your congregation and friends. 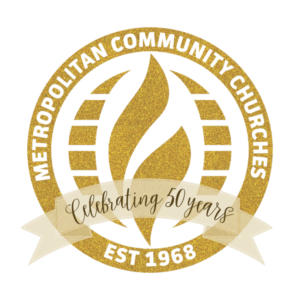 Celebrate Anniversary Sunday by taking a special offering during October in honor of MCC’s 50th Anniversary! Churches, Ministries, Oasis Communities, Organizations, and Individuals are all invited to participate. Sign up at [email protected]. In 1968, Reverend Troy D. Perry, believing that God makes no mistakes and loves all of God’s children regardless of sexual orientation or gender identity, began a movement that has forever changed the face of modern Christianity. What began as a small local congregation in Los Angeles, Metropolitan Community Church Los Angeles, has grown into the Universal Fellowship of Metropolitan Community Churches, a global Christian network of congregations in over 30 countries. MCC is one of the largest and oldest lesbian, gay, bisexual and transgender (LGBTQI+) organizations in the world. 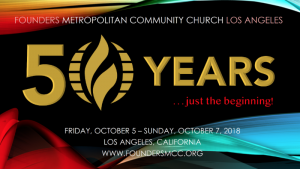 For more than 50 years, Founders MCC has been at the vanguard of the civil and human rights movement in LA. Rev. Troy D. Perry, our founder, has lead this clarion call of a house of worship where all of God’s children are welcome. 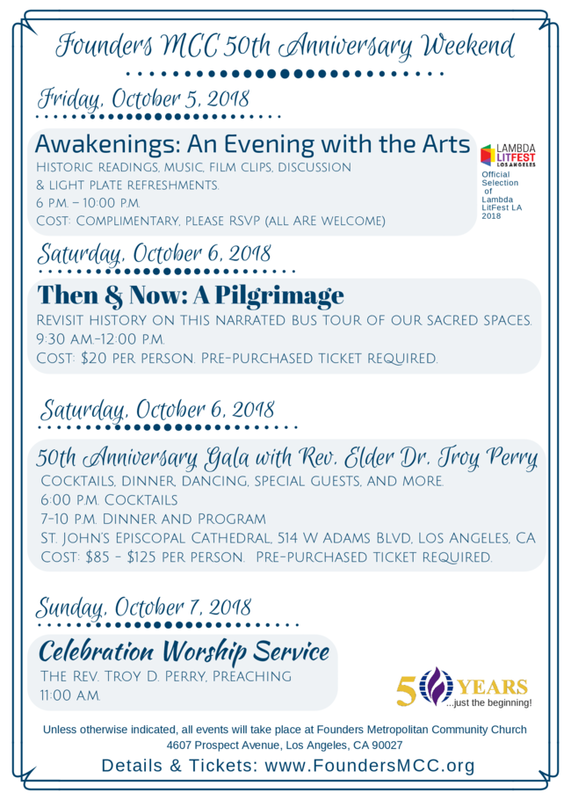 Please join us in honoring the Reverend Troy D. Perry as we celebrate the great history, accomplishments, and outreach of Founders MCC at our 50th Anniversary Gala. Remember it’s: just the beginning! This 30 second in length video may be recorded with an iphone or android and then sent to: https://spaces.hightail.com/space/mhRuqn9uql or email [email protected]. Please record your message in the highest resolution of your camera. Make sure your email has the churches full name, location and Pastor’s or Lay Leader’s name. We will produce a montage of tributes, which will be presented at the 50th Anniversary Gala, Saturday October 6 at St. John’s Episcopal Cathedral in Los Angeles, CA. Make your video light-hearted or spirit-filled or personal or all three. Sing, act or just have your congregation wave and say “Congrats”! All videos are welcome! Unfortunately, all videos will not be used on the montage but all videos will be presented to Rev. Troy as a keepsake of this auspicious occasion. Also if your church would like to be a sponsor in the Gala Program Book, please go to our website: www.foundersmcc.org and click on the sponsor’s link. Sponsor ranges from $35.00 to $1,000.00 or you can make a donation of any amount. The anniversary committee hopes to see you during this special anniversary weekend and/or on your congregation’s video. This five-week worship series loosely follows the five decades of MCC history. We explore the ideas, movements, and topics that have created our identity: Open Table, Love, Justice, Hope, and Faith. In this resource kit, you will find more readings, prayers, and ideas than can possibly be used each week. Our hope is that you review these materials and create a worship service that fits your context. We’ve also included ideas from some of our emerging churches that are engaging in worship in different ways. Consider adopting these ideas into your context as well. Next month, we encourage you to film or photograph part of your worship service and share it with the larger MCC community. You do not need fancy equipment, a simple phone camera will work! Take a video of the call to worship, an original song, a prayer, a dramatized version of a scripture reading; photograph art, the altar, the creative response time or whatever else you want to share. Post these on the Clergy/Lay Leader page on Facebook and use #Celebrate50 or email them to [email protected] so everyone can see your congregation!